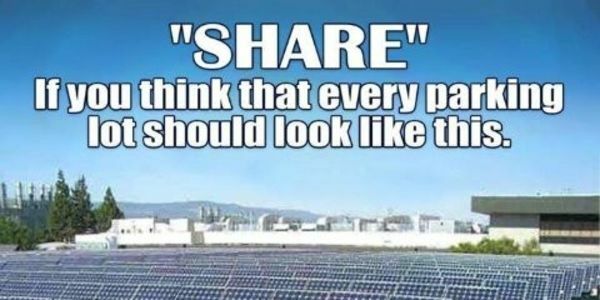 petition: Help Florida become a "Pay for Shade" state: Support solar panel shade on mall and stadium parking lots. Help Florida become a "Pay for Shade" state: Support solar panel shade on mall and stadium parking lots. When you sign in favor of "Pay for Shade" parking, you promote the solar energy industry in Florida, subsidized through parking fees. With algae blooms in our waterways, "accidental" burning of 60 acres of wilderness preserve, methane gas pipelines traveling through our sensitive wetlands, carcinogens now permitted in our drinking water, wouldn't it be a positive gesture before you leave office to encourage the Chambers of Commerce in Florida to initiate "Pay for Shade" solar panels installation in mall and stadium parking lots throughout the Sunshine State? This lucrative venture could be a win-win for everyone: win for Florida merchants and win for our Florida environment.